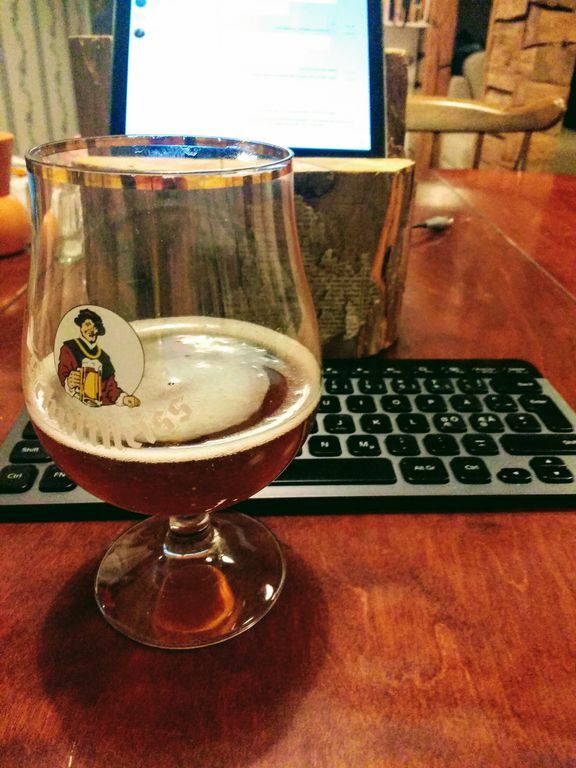 It's been over a year since I last wrote about homebrewing. Well, I guess I was rather doing than talking about it. 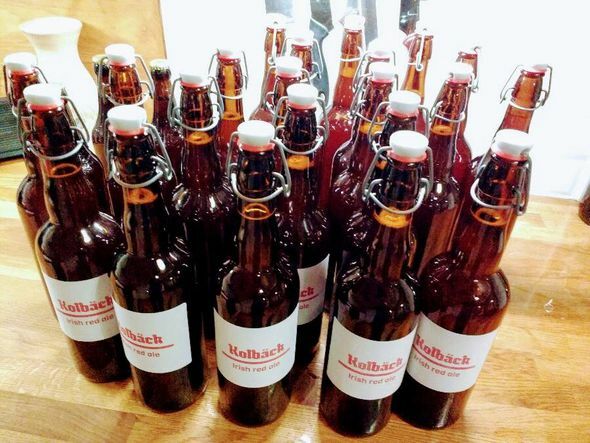 The number of batches has been steadily increasing, the latest #35 is a red Pale Ale with lots of Ekuanot hops. 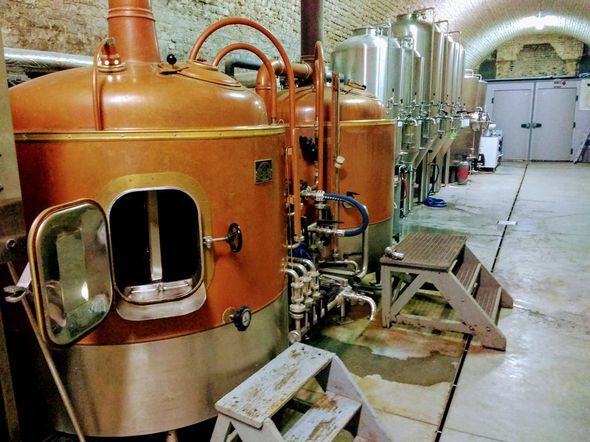 Overall I've been following the seasonal styles tradition, meaning that I brewed a few lagers last winter (Helles, Dunkles and a very good strong Schwarzbier), some wheat beers in summer (both Bavarian and Belgian Wit), and Pale Ales and Stouts in between. 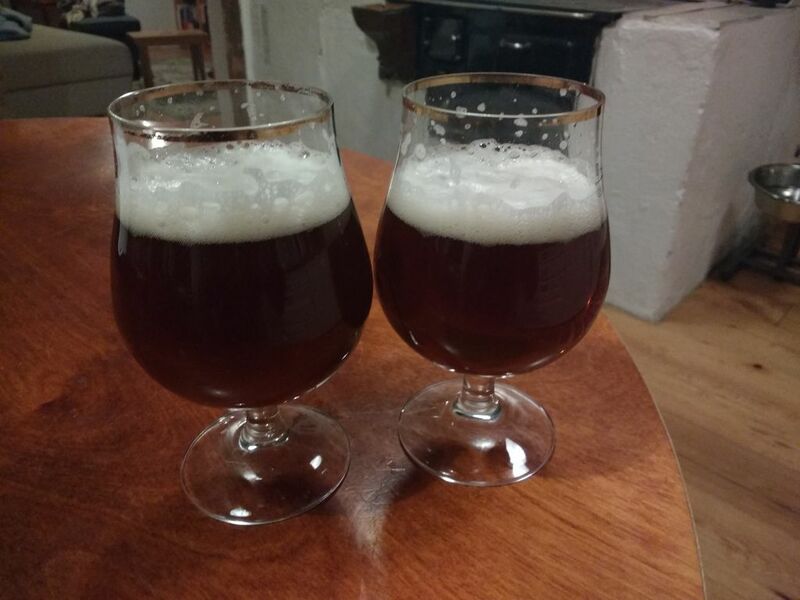 My clones of the Sierra Nevada Pale Ale (SNPA) and of the Chimay Red Belgian Dubbel came out very nicely. Next up are lagers again, starting with a Bohemian Pilsner. With two years into the hobby, it makes sense to add up some numbers. 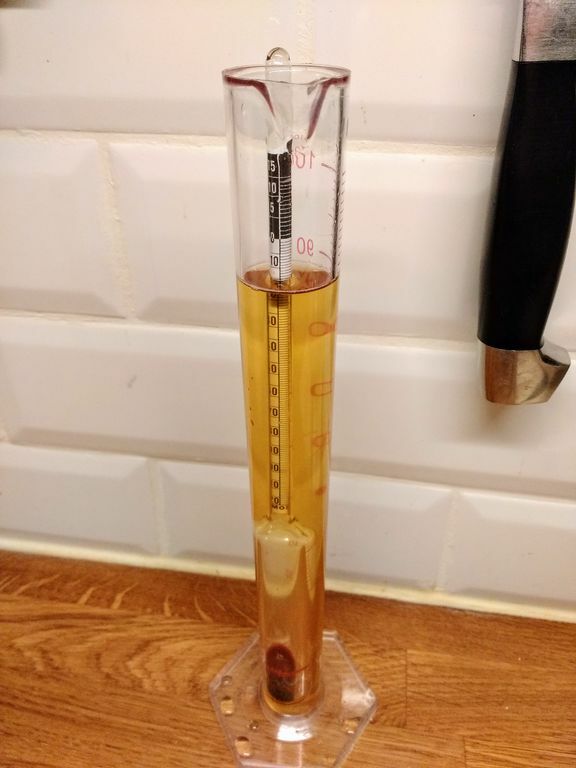 I've now brewed 988 liters of beer with an average strength of 5.5% alc/vol and average batch size of 28 liters, where the size has been increasing over time once I figured out that you can dilute wort after boiling to make more of a weaker beer. This suits me well since I prefer highly drinkable beers to the show-off super-strong ones. Summing up my order history on the relevant webshops for ingredients and equipment, I arrive at 1200 EUR. Adding another 200 for things unaccounted for, I get 71¢ per half-liter-bottle, which I usually use. This is about 75% of the price for the very cheapest beer that you can find in Swedish alcohol monopoly shops, and about a fifth of what a SNPA sets you back there. Contrary to many other hobbies, I can therefore safely claim to actually having saved money with it. 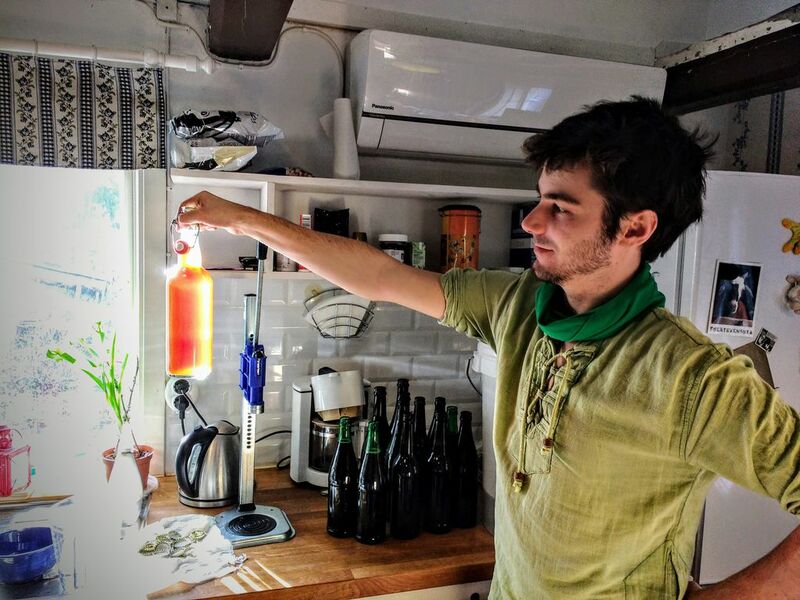 Although this was not the initial intention and still is far subordinate to the joy of making drinking my own beers, I like that homebrewing is not a money-sink for me. I'm sure it can be that, and is for some, but I've been following my usual rule of buying less and only very modestly upgraded the equipment. 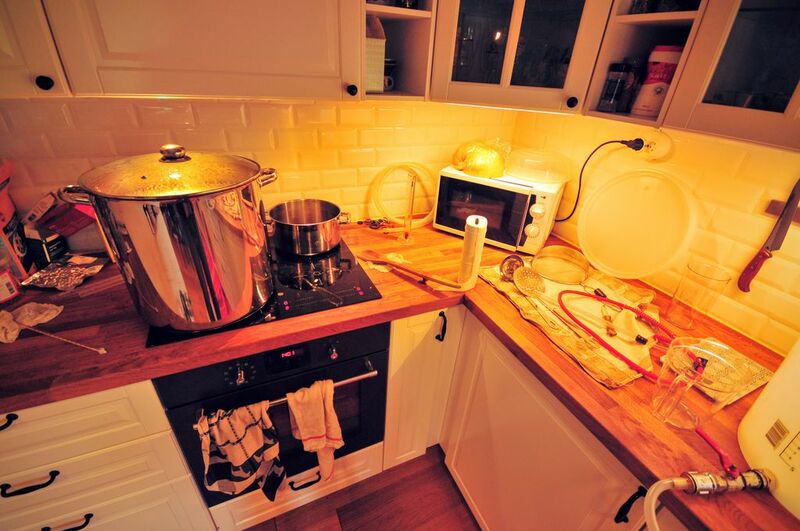 For example, I still use the same 30L-kettle for mash and boil as for the very first batch. I also built a magnetic stir plate from scrap material that I had lying around. This is useful when harvesting yeast from bottles and to increse the cell count to get an adequate pitch rate for a batch. 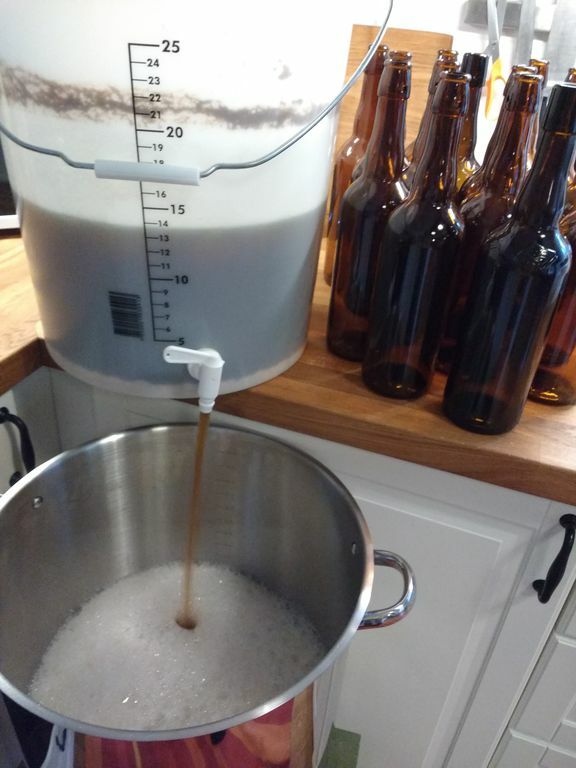 Following up on my previous post about homebrewing beer, it is about time to mention batches #8 to #12 that we've been making since March. As before I'll link below to the GoogleDocs that we use for keeping logs. 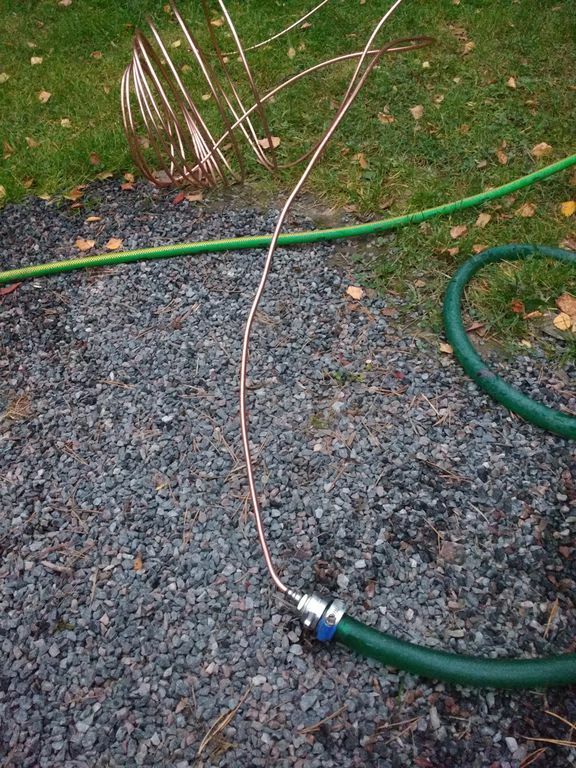 But first let me mention the most important thing I've learned since that last post: water adjustment. Looking at the analysis from our own deep well I found a good explanation for why our light-colored beers had a harsh and unpleasant bitterness to them; turns out that our water has a high rest alkalinity, causing a too high ph-value of the mash which in turn causes this astringency. The best compact explanation and adjustment calulator I've found so far is this one, in German though. The link has our water values pre-filled, so you can easily see that we would have needed to add 7ml of lactic acid to the mash water to compensate the alkalinity for a Pilsner like our #5. 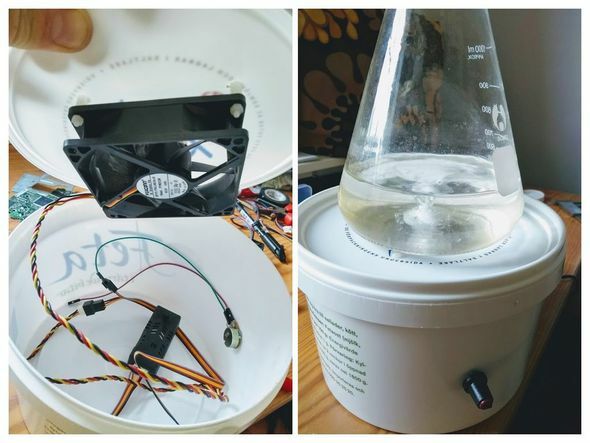 When it comes to equipment I've only made a few minor improvements, like lautering into a newly-bought 3l-beaker instead of the boiling pot. This shortens the time until boil because the heat can be on as soon as the first beaker is emptied into the pot on the stove. It also eliminates the critical moment of liftig the full pot up onto the stove - dropping it, or one of the handles to break off would result in 27 liters of sugar solution being spread all over the kitchen floor, not a pleasant thought. On the other hand, we now have to be careful to not let the beaker run full; yeas, it has happened once already. I am also more than halfway into reading J. Palmer's How to Brew which I bought recently. It nicely summarizes what I had learned so far from various sources, it explains the why behind certain rules and practices, and generally goes into much more detail than I had expected from an all-encompassing book. Highly recommended! The #7 Copper Cascade Lager already mentioned last time turned out very good. Red and dark-ish, it was nicely malty and lacked the astringency of the ligher beers before. In hindsight this is as expected, since darker malts work better with alkaline water. #9 A&K Festbier was a light Ale after a recipe that matched more or less the ingredients that I had left. It turned out nicely, perfectly drinkable, but not spectacular. The #10 Blonde was a failure in the sense that I wanted to re-make the Weißbier from above, but messed up when ordering ingredients online; I thus had no wheat malt. But the WLP300 yeast needed to be used so I improvised the malt mixture. Recipe-wise it somewhat matches a light Belgian ale but the yeast made a "Weißbier" out of it anyway, with a clear resemblance to #8, but quite not as good. Still surprisingly drinkable. #11 Bockbier was the birthday present to myself, trying out a stronger beer for once (OG 1.062, 6.8% vol.alc. ), in the style of a light-colored German Bock. This was bottled almost two weeks ago and I just tried the first one this evening, prompting me to write this post. Because it is amazingly good! Very pleasant, not astringent (water adjustment seems to work), and hiding its high alcohol content well - the kind of stuff that is dangerous! In the sense that it is all too easy to have one too much of. I'll give the other bottles a few more days of conditioning before they go into the fridge. #12 IPA. Finally, we also gave in to the trend and made an India Pale Ale, first time dry-hopping from day 8 to 12. I bottled it today (see picture above, together with #11) and it will stay at room-temperature for a little less than two weeks, as usual. Report on how it turned out will follow. 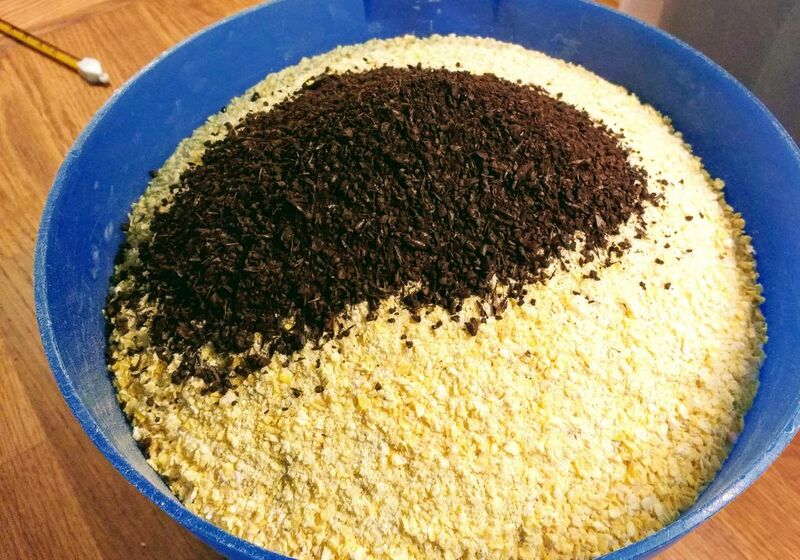 The next two batches are most likely to be a dark Lager (Münchner Dunkles) and a proper re-creation of the #8 Weißbier. This time with yeast starters to have the proper pitching rate of yeast cells - many of the previous beers had a too-low amount of yeast added in the beginning, according to Palmer's wisdom. 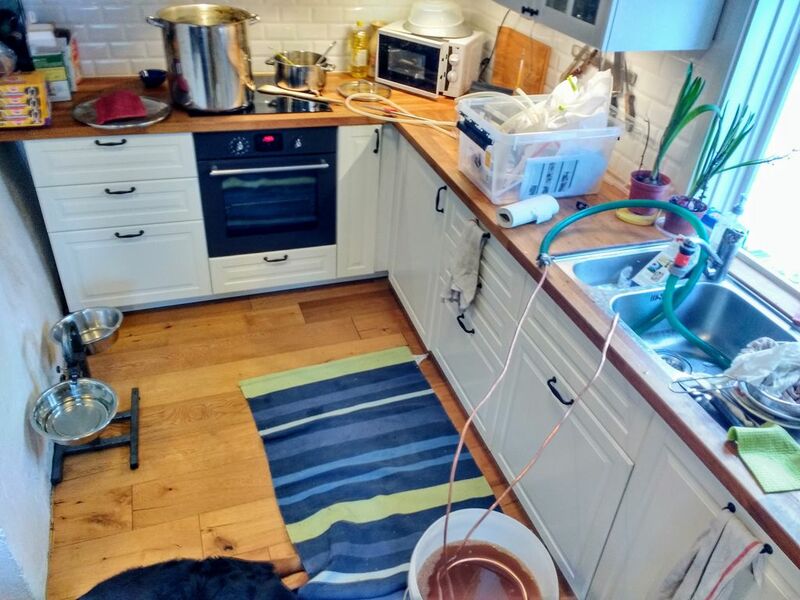 In November last year, two colleagues and I happened to talk over lunch about home-brewing beer; a few days later packages with equipment arrived at our door-steps. None of us had any real experience and I only vaguely remembered a good podcast (CRE 194, in German) on the subject. But how hard could it be? So we read a few websites and ended up following the beginner's instructions at brauanleitung.de. Our equipment is for the standard homebrewers' batch size of ~20 liters (5 gallons), meaning a big pot, two plastic buckets, one for filtration, one for fermenting; a few hoses and connectors, plus the actual ingredients for our batch #1: a single hop and single (Pilsner) malt for a German-style "Altbier", that is a light ale like they were made before Lagers became popular. The result was good. Not the most amazing beer ever (partly because we were impatient and did not give it enough time from bottle fermentation to drinking), but definitely good enough to continue! I will link below to the GoogleDocs that we used for keeping our logs; these are in a varying mix of three languages (Swe/Ger/Eng) since we all know them to some degree and gathered recipes and information this way. But fellow brewers should be possible to read the recipes anyway. Our #2 was an Irish Red Ale. This was a big step up, following a proper recipe with four times as many ingredients as our #1. 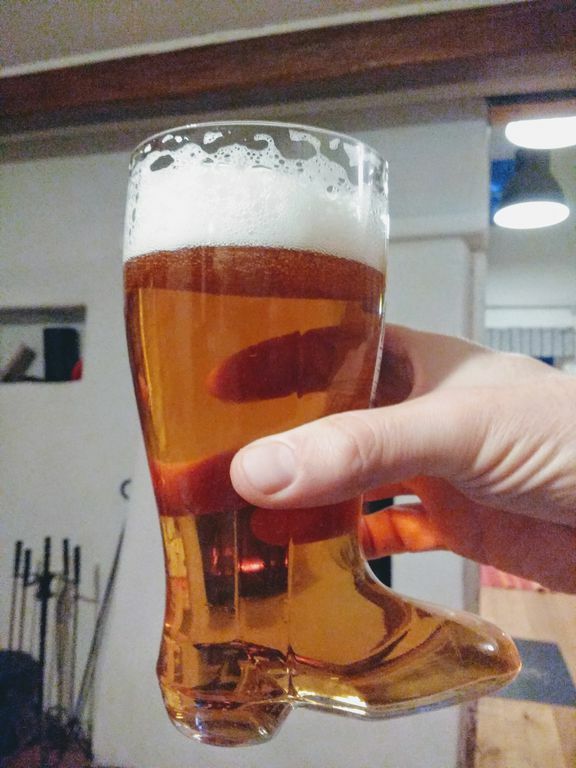 We thought it would fit nicely as a Christmas beer, and it sure did. Very malty, not much hops, almost sweet because of the liquid yeast with lower attenuation. The Brown Ale #3 came into being through me just taking some remaining ingredients from the previous two batches. It turned out quite all right, more bitter and hoppy than #2, less malty. 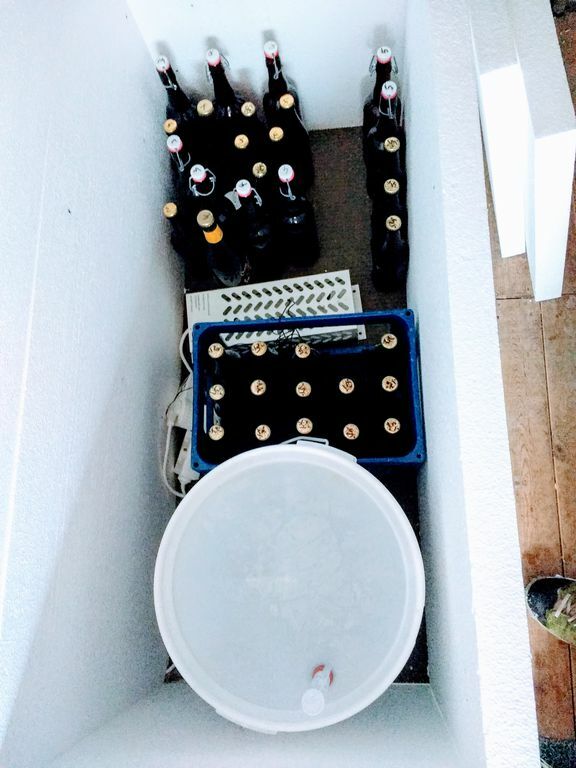 Next we wanted to try a Lager, since our closet in wintertime holds a temperature of 10-12 C, perfect for bottom-fermentation. 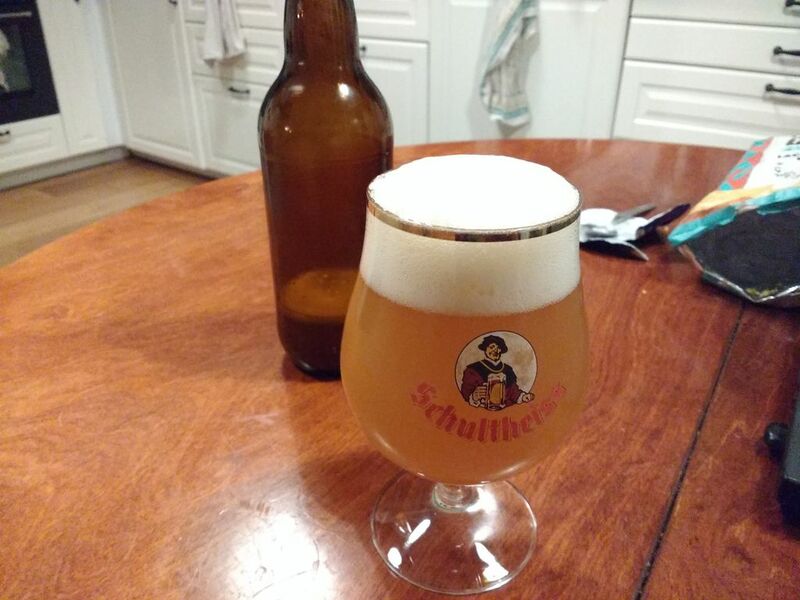 So #4 became a Helles, that is a Munich-style light lager and it went really well. Clear, great color and taste, better than the average commercial Helles I tried at the time in Munich. Continuing in the same line, our #5 is a Pilsner. Quite happy with that one as well, on the upper end of hop and bitterness for my liking, but far from any of the trendy IPAs that go berserk on the hops. 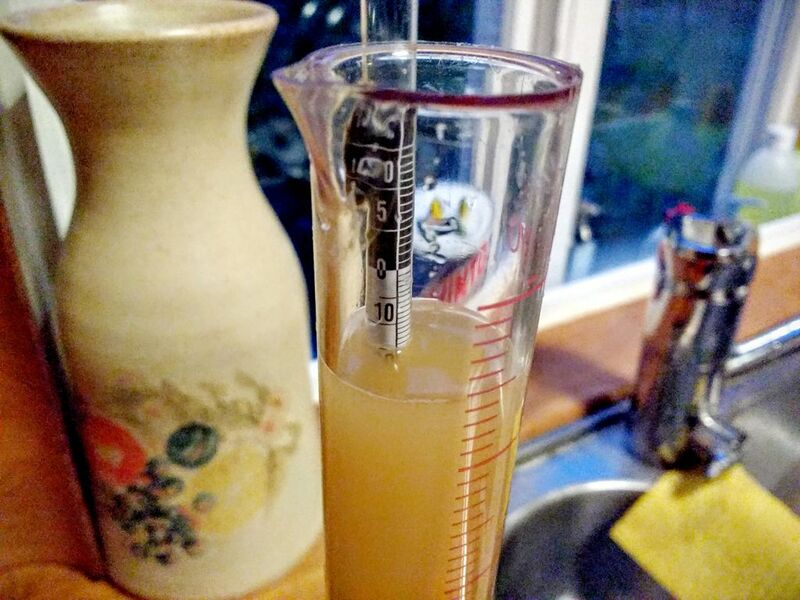 The dry yeast settled better in the bottle than the one we had for #4, so it it easier to pour clear into the glass. 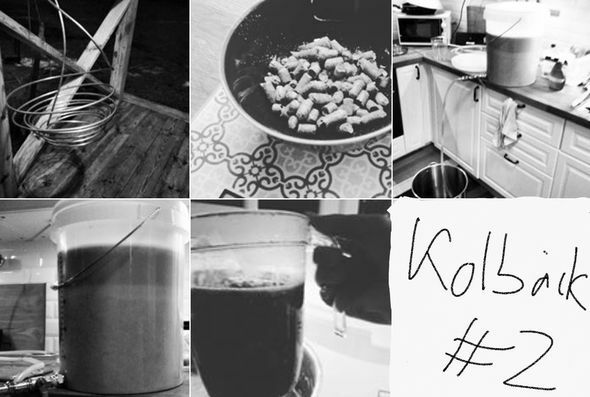 For #6 we went for a Dark Ale that has some torrefied maize among the ingredients. 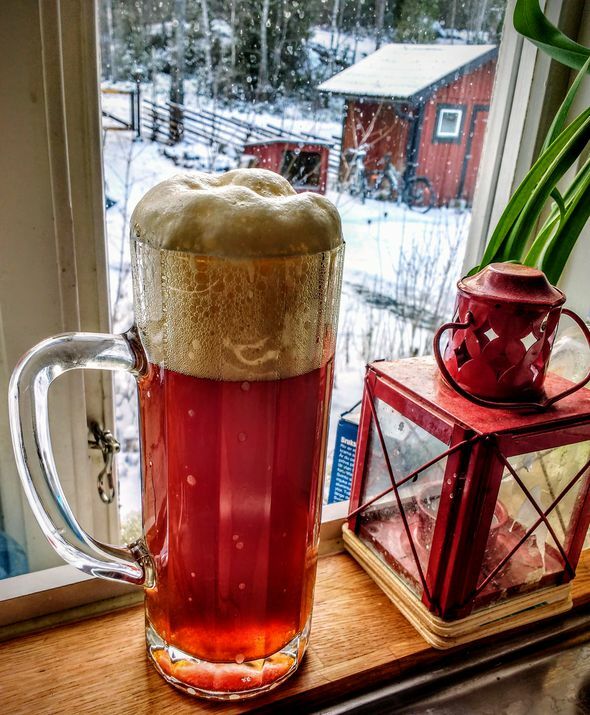 It makes for a fantastic foam, but maybe we overdid the carbonation a little because it foams by itself when opening a bottle, and the sediment gets torn up and mixed. Fortunately it settles quickly in the glass after pouring. Another very pleasant malty ale! #7 is Copper Cascade, another Lager, reddish this time, probably the last for this winter. This batch is about to be bottled, so no verdict on the outcome yet. Overall the above means that I now have a little stash at home to enjoy whenever I feel like it, which is very luxurious. 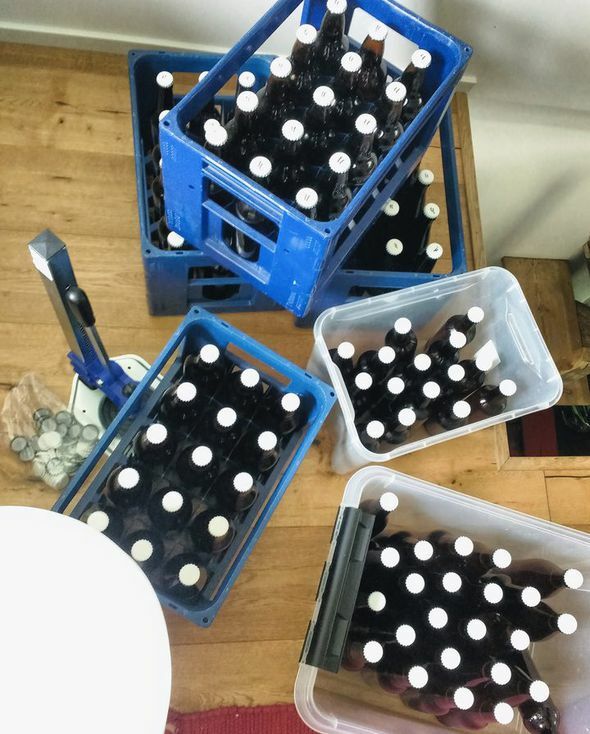 We have some routine in brewing and bottling now, no screw-ups yet, it is still fun and considering Swedish prices on beer, our small investment in the beginning has already more than paid for itself. We will therefore continue, maybe at a slightly slower pace than recently. Next in line are a Bavarian wheat beer and an IPA. The malts and hops are already on the way. The kitchen with 30 litre pot, filtration bucket to the right. Almost done, just cool-down, pitch yeast and cleaning. Last night I bottled our second homebrew batch, an Irish red ale. The nice 0.75l bottles with latches come from an excellent French beer, Brasserie Du Mont Blanc. 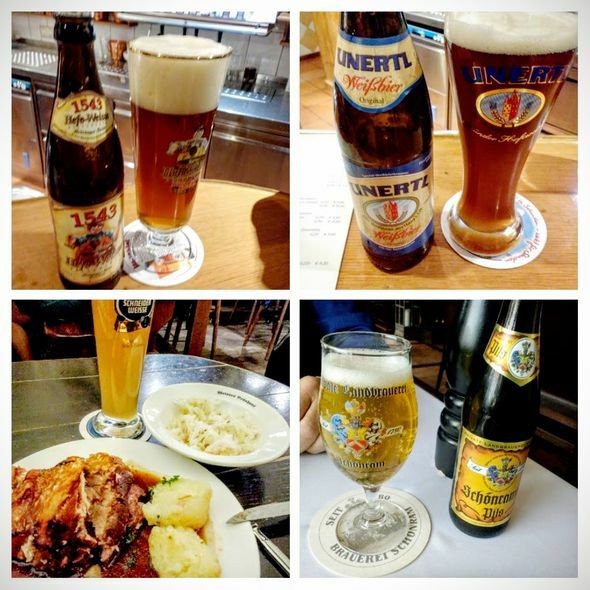 I was in Munich the other week.